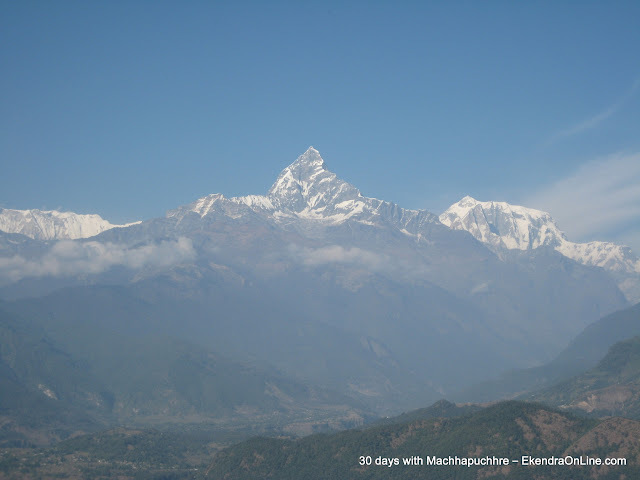 Machhapuchhre (माछापुछ्रे), the Fishtail Mountain vibrantly seen from Pokhara, lies in the Annapurna Himalayan Range (Coordinates 28°29′42″N 83°56′57″E). I tried to cover some photographs of this mountain from my home in Pokhara last October-November over an entire range of the month, but since winter had just started there were many days when the beauty of the Himalayas could not be seen. 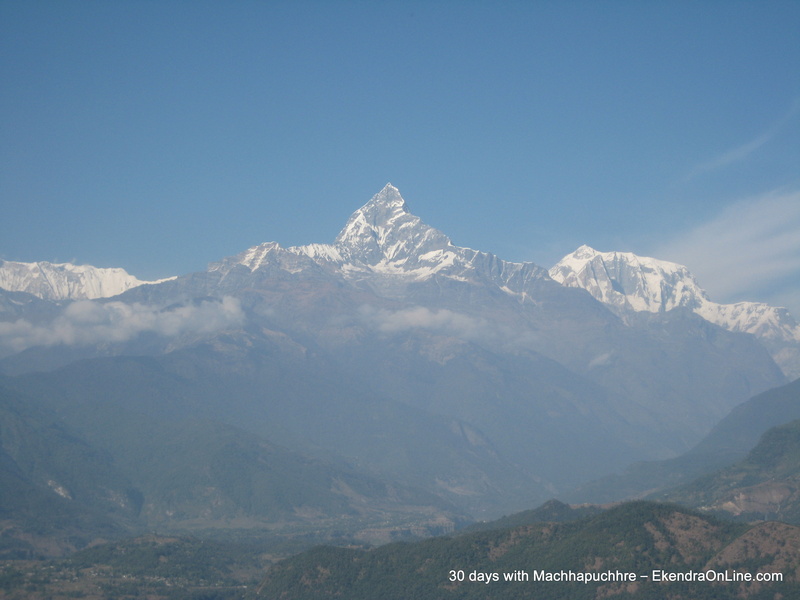 Trivia: Machhapuchhre is the only mountain in Nepal which is not allowed for conquering! 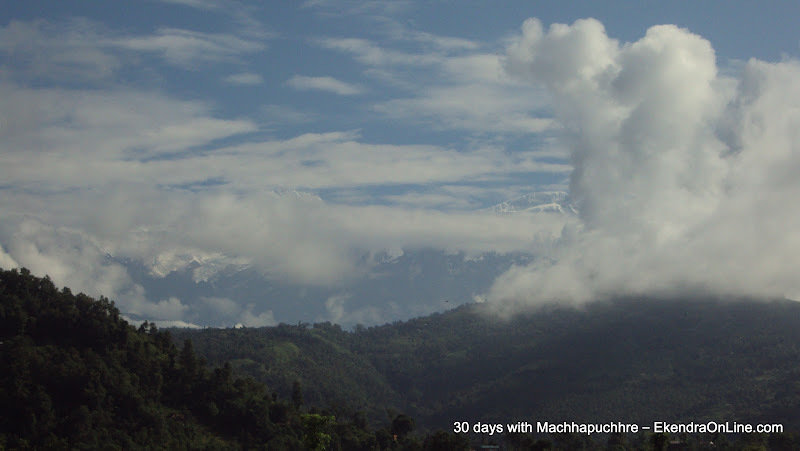 Day 1: Machhapuchhre looks awesome, maybe I’ve been watching at this beauty after a long time. Whatever, Fishtail is always enchantable to most of us. Below is the typical picture of how it is seen from almost all homes in Pokhara city. 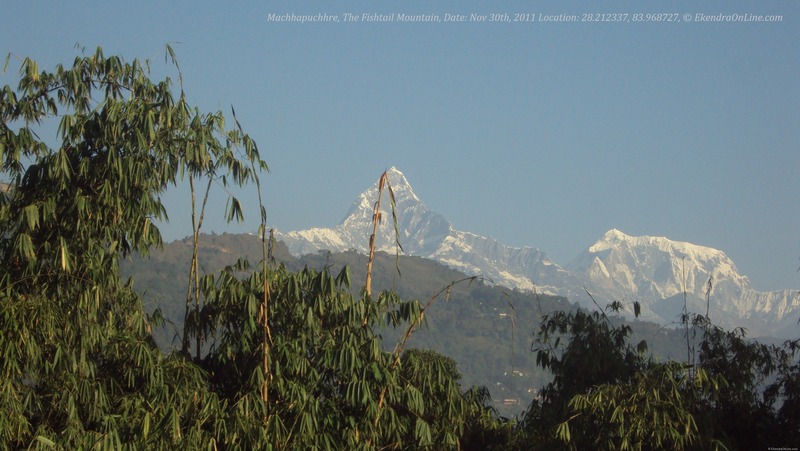 Machhapuchhre as it is seen from almost all homes in Pokhara! Pride held high as the Himalayas - can you spot the tiger in the Machhapuchhre? Day 20: December 4, 2011 Sunday; Winter has hit Pokhara, Sun hardly comes for few hours and Machhapurchhre is so happy to get the sun rays on it. Day 21: December 5, 2011 Monday, The bad winter weather, it is all foggy with late noon Sun. Bad luck couldn’t see the Himalayas today. 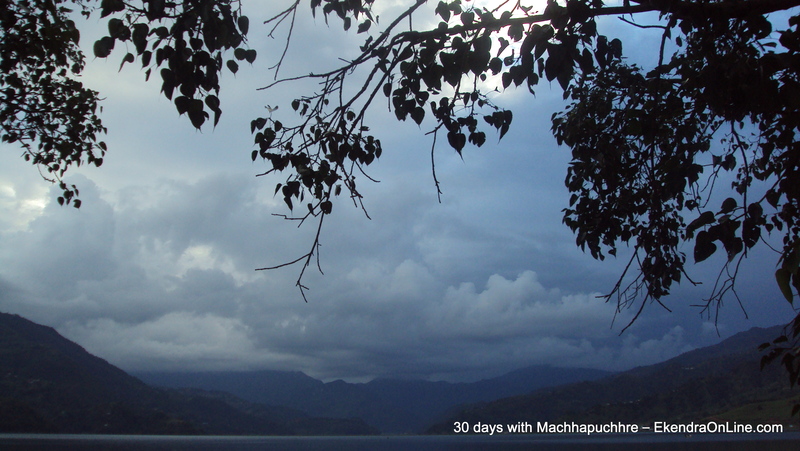 Day 27, 28, & 29: Winter has hit Pokhara so hard, hardly could I see mountains on these days. Besides, no matter even if it’s winter in Pokhara, rain still has the way bringing in more drop in temperature. A brief information about Fewa lake here, since I got glued to going this lake during this period. Also was amazed to see, how popular was Pokhara and Fewa lake in Flickr. Phewa Lake or Fewa Lake is the second largest lake in Nepal, located in the Pokhara Valley at an altitude of 784 m (2,572 ft). Annapurna looms in the distance from the Pokhara town and the lake is famous for the reflection of Mount Machapuchare on its surface. During sunrise those snow-capped peaks lit up and the stillness in atmosphere helps for that perfect reflection, like one below. All the photographs/pictures of Pokhara, Fewa Lake, and the Fishtail can be browsed in full HD resolution from my Picasa Web album here.